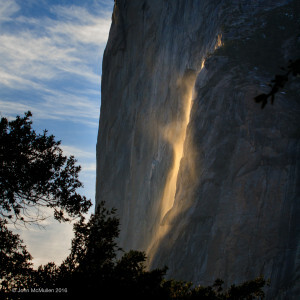 Every year during the last two weeks of February, hundreds of photographers come to Yosemite National Park to attempt to photograph the iconic Horsetail Falls Firefall. This year I chose to avoid the maddening crowd of photographers on the valley floor — literally hundreds of photographers in one spot, making photos of the same thing, from the same angle, with the same results — and find a nice quite location where I could focus on making a photograph of the event from a different perspective. Even more people on a Sunday during the weekend! I found a nice spot up the 4 Mile Trail where I spent most of my time chatting with a very nice fellow about our experiences in Yosemite Valley and beyond. It was quiet, relaxing and well, perfect. I had my kit set up and was hoping to catch a well lit waterfall with a dark ridge in front of it. The light was good for this photo 30-45 minutes before the “prime time” from below and I captured a couple of nice shots around 5:00 PM. The sun went behind some low clouds just before sunset and so I wasn’t able to catch the most red light (I did get a couple of interesting photos, but they weren’t close to what I had hoped for.) So basically, it was a very successful “scout” mission. One of the greatest bonuses of living in El Portal, at the west entrance to Y.N.P. is that it’s only 20 minutes travel time to get to the Valley. So I am set to go back again and get the shot I want … and now I know exactly what I need, it will be even more fun, and I won’t carry so much stuff! This entry was posted in Photography, Yosemite National Park.